In this business world, there are multi-theatre in most of the places. 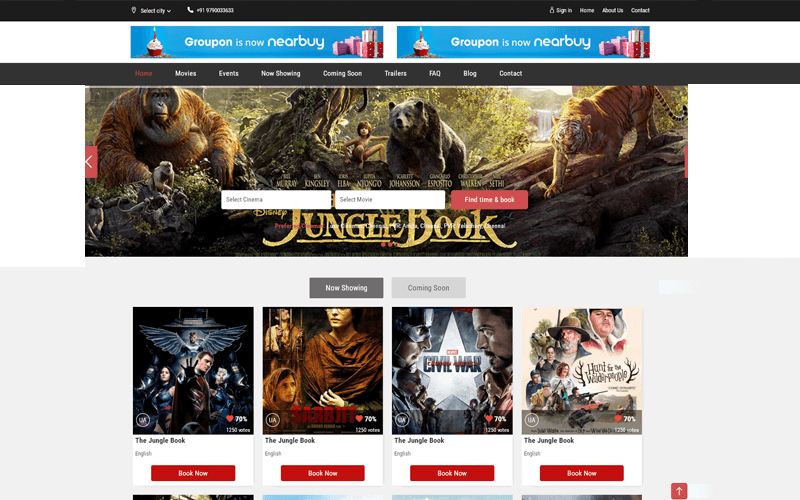 If you own more than one screen for your theatre then our script suits well for your business. PHP scripts mall has implemented the multiplex theatre booking script. This software is an accumulative and favorable solution for the theatre owners. It helps to fetch you an adequate yield. We can interpret the underlying notion of cinema management and developed this script which puts everything in a single page and you can have an outlook at anytime. This ticket reservation system allows you to handle reserving seats event and e-ticketing events in wholesome manner. Including foods and beverages events also can be managed very smoothly. Our web based theater booking script assists multiple screens with multiple tickets booking and different time zones for different movies. This readymade theater booking software has a powerful admin panel, so you can take control over the movie and decide when the particular movie has to be run. It also controls the collection details like employee collection details and screen collection details in daily basis, weekly basis and monthly basis manner. This script has a responsive design, so it can be accessed from almost all the devices and has user-friendly navigation. We are aware that there are hundreds of similar kinds of products in the market, then again, our products are unique and we assure with our 12 years of experience and 100+ customers. We have offered 7000 man hours for this product. We know that almost all the theatre owners and operators do not have technical knowledge that is why we also provide 1 year of technical support, free updates for the source code for 6 months. We will provide you with the full source code upon purchase of the script and your website will go live within the next 24 hours. View food and drink details. I was searching for a script like this for so long time and finally I have landed in a good place with all the pleasures. I thank God for showing me this script. The customer support team is well organized and available all the time to solve the issues of mine. It has good design also. This script boosts my sales 200% up! These guys was done professional job!